Julian Draxler is rated as one of the best young attacking midfielders in European football. The 20-year-old is a member of Joachim Low's heralded Germany squad who play rivals and fellow World Cup 2014 qualifiers England at Wembley on Tuesday. 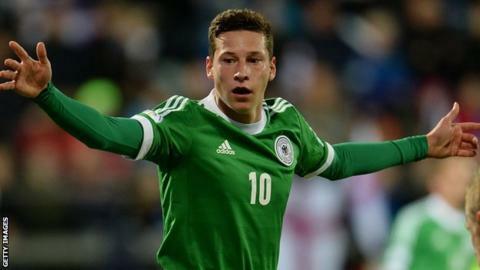 The Schalke player discusses what he thinks of the England squad, Germany coach Joachim Low, his World Cup hopes and the possibility of playing in the Premier League. How well do you think Germany will do at the World Cup? I think we can say we are one of the favourites, but there are a lot of very strong nations. The World Cup in Brazil is always something special - we have the temperature and different climate to consider. I think we can do very well and reach the final. Which England players would be good enough to play for the Germany team? Do you think Germany have produced more and better young players than England in the last five years? What is the difference between the styles of Germany and England? That's a difficult question to answer. I can speak about us. We have very talented footballers who play nice football, short passes, fast passes, and we have players like Mesut Ozil who can make a difference. The last games of England I didn't see. But my opinion is that they work football and we play football (laughter). So England work hard when they play football and Germany play more attractive football? At the moment I would say yes, but if we lose against England you can say I was wrong (more laughter). What do you know about Wembley? It's a very traditional stadium. We know about the legendary Wembley goal [1966 World Cup final]. It has always been a dream to play there and hopefully I'll get the opportunity. You know England might be looking for revenge after what happened at the 2010 World Cup? I think it's always been like this - Germany or England have always looked for revenge. Do you think Germany will win? I don't know. I can't see the future. When you started playing football did the coaches focus on technical ability or physical strength? It was always technical. I love to play with the ball. I don't have the body of [wrestler turned actor] Dwayne 'The Rock' Johnson. In professional football you have to have the good body, but it's not my main strength. What is Joachim Low like as a coach? I've never seen him lose control. He analyses the game. It doesn't matter if it's 3-0 to or against us, he's always in control. He wants to make the team better and has done a very good job in the last few years. He's signed a new contract, so Germany can be happy about it. What has he told you about your future and what does he want from you? He said I'm very talented and that I can do very good things with the ball. I have to improve my game without the ball and learn to defend better. But he wants to have me in the team and improve the way I play and help me improve myself. I'm very proud that I can work with him. Who advised you to choose football as a career? My father, because he also played for Schalke. He didn't become a professional, but he played for the under-19s - he wanted me to live his dream. And now that I've made it, he's very proud. What does he want from you now? My father is never satisfied - he always wants the best from me. If I play badly, he will tell me. It doesn't matter if I'm 20, 25, 30 or if I win the World Cup twice. If I play badly he will tell me. He wants me to improve myself and make the best out of my talent. Are you critical of yourself? I am kind of critical. Some games you are good and some you don't do that well. I often look at my games on TV and see what I can do better. I think that's a good way. If you want to reach something you have to try to work hard - that's what I try to do every day. I'm very proud to play for Schalke and the national team. We have so many good players. I have dreams. I'm very young. I want to win titles and play for the biggest teams in the world. Would you like to play in the Premier League and do you think you are ready? I like English football. I like the Premier League of course - it's one of the best leagues in the world. You have big clubs like Arsenal, Manchester United and Chelsea - of course it's a big dream to play for one of them. I have my favourite team, but at the moment I'm at Schalke. I don't want to talk about other clubs. If I state Arsenal or Manchester United, maybe I'd read it tomorrow in the newspapers (laughs).